Exactly what the Deep might be is unclear but it will do favours for its friends, the so-called witches. These favours can be as mundane as moving solid objects across a room or as remarkable as moving people from one planet to another halfway across the galaxy. Although faster-than-light vessels exist, travel via the Deep is fast and cheap enough that the witches wield considerable power. Why the Deep chooses the people that it does is as unclear as its true nature. There are general patterns. Tembi is an exception to them all. The Deep appears to prefer rich people over poor; Tembi grew up without running water. The Deep favors the mature; Tembi is far younger than any previous witch. Despite her protests, Tembi is hauled off to Lancaster, the witches’ school. She must learn to control her powers; if she cannot, she will be a danger to herself and everyone around her. Once she enters the school, accidental death is still a real possibility; however, the effects on others will be limited. Tembi learns many things at school. Perhaps the most frightening thing she learns is not part of the curriculum: there is no escape from responsibility for those with power. The witches’ claim of principled neutrality is just a pretense. Refusing to take sides in wars or conflicts favours the powerful. Inaction may seem morally superior, but it still kills people. A few witches are determined to change the stated policy. Others are just as determined to resist. Caught between is one young witch. The conservative faction isn’t motivated by mere callous indifference. “We take no sides in any war” is safer than “we only side with the righteous”. If the witches take a side even once, then it will be reasonable for combatants to beg for assistance in every future conflict. Because this is a prequel for an upcoming series, it’s much more focused on asking questions than on answering them. The reader gets a fair idea of how the Deep behaves, but not why. That seems fair, because that is the witches are just as puzzled. One of the common maladies afflicting readers of a certain age who have read thousands and thousands and thousands of books is that everything one reads reminds one of something else one read. In this case, I (reader of a certain age) see parallels between Spangler’s witches and the late Kevin O’Donnell Jr.’s Flingers; Spangler is considerably better at maintaining a consistent tone than O’Donnell. There are also parallels between Lancaster and a certain Scottish boarding school for wizards, but Spangler avoids arbitrary social divisions1 between schoolmates and maniacal antagonists. She plumps for irreconcilable philosophies with a side order of poisoning and kidnapping. Plucky Tembi recalls certain Andre Norton characters. Like them, the young witch comes from an unpromising background, and like them she has not allowed a life spent as a target for excessively diligent cops to scar her (she has, however, retained some very useful street skills). The plot may be guiding her towards epic events; the Deep certainly is. Tembi simply wants to master her witchy skills and earn a place for herself. Oh, and deal with this whole “first romance” thing, which I can assure you always goes perfectly for people her age. This is a short but effective introduction to the series. I look forward to the first full length novel. Stoneskin is available here (Amazon) and here (Chapters-Indigo). 1: Social differences based on actual lived experience do exist. Most students come from wealthy backgrounds. They are older; they have travelled; they are well educated. To balance that, Tembi has personal knowledge of casual police brutality. Experience tells. 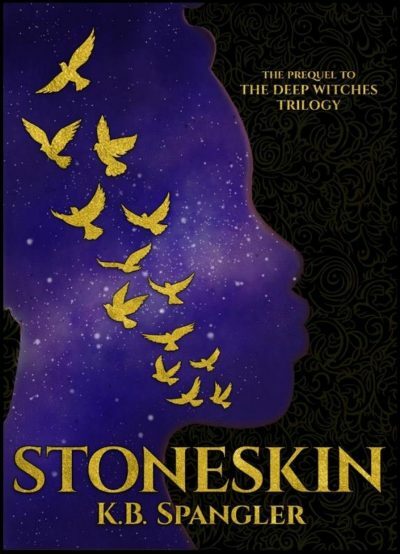 It's funny the things that bug you, but: if the Deep Witch Trilogy is upcoming and hasn't been published yet then Stoneskin cannot be a prequel to it. Prequels by their nature are produced after the work they are set before. The Ur-example is the film Butch and Sundance: the early years, which was filmed after Butch Cassidy and the Sundance Kid but set years before (by necessity, considering the ending of the first film). The producers at the time claimed to have coined the word "prequel" to describe their film. Amusingly, The Hobbit the book is not a prequel to the book The Lord of the Rings, but the film the Hobbit is a prequel to the film The Lord of the Rings.